Converting to binary from normal base ten numbers is a difficult and time consuming process. 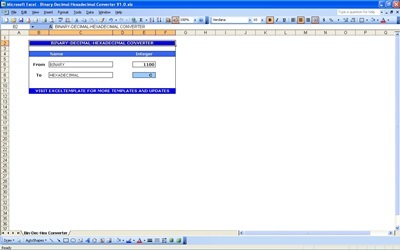 Using our excel based binary converter will save you much time and frustration. Get your own binary converter for free here! To understand how a binary converter works, you must first understand what binary, or base two, is. In our normal base ten accounting each number has a ones place, a tens place a hundreds and so on. In base two there is a twos place, a fours place an eights place, a sixteens place and so on. For an example of a binary convert, lets use the number fifty. The highest base number that would go into fifty is 32 so that place would get a 1. Subtract 32 from 50 and there is 18 left. The next highest base two number to try is 16, since that’s less than 18 that place gets a 1 and there are now 2 left. Since 8 and 4 won’t go into 2 those places get a 0 and the twos place gets a 1. The ones place them gets a 0 since there is nothing left and your result for 50 is 110010. Wow that’s a lot of work for one binary convert! Now it’s becoming clear how time saving our binary converter can be. Binary convert processes are used by computer programmers to communicate directly to a computer. Most professionals use a binary converter like ours rather than do the work manually. Because of the way computer memory works a computer can only understand two states, off and on, represented by 1 and 0. Eight of these ones and zeros constitutes one bit of information which can represent one character to a computer. Writing the word “hello” then requires 5 bits of information and 5 seep rate binary convert calculations, thus the need for our ultra reliable binary converter. Our binary converter is an amazing piece of excel programming allowing the time consuming binary convert process to be completed in seconds. And, converting to binary is not all we offer. The same minds that brought you this also offer many other excel templates for business, home and gaming use. Be sure to look at them all!